A new six-axis horizontal-spindle machining centre — available with working volumes starting from 4,100 x 1,600 x 650mm, options of 2.1 and 2.6m in the Y axis and up to 30m in the X axis — has been introduced by the German company F Zimmermann specifically for the production of structural components in the aerospace industry. These machines are available in the UK and Ireland through Gosport-based sole agent Kingsbury (www.kingsburyuk.com) and in the Middle East through Kingsbury Gulf. 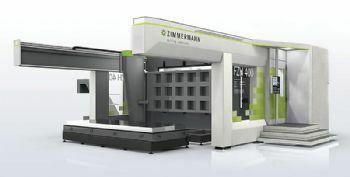 Equipped with an integrated and expandable pallet-change system that automatically loads the component into the vertical plane for machining, the FZH400 is the first horizontal machining centre from F Zimmermann — a long-established manufacturer of gantry-type vertical-spindle machines. The new configuration allows gravity to effect the efficient removal of copious volumes of aluminium swarf generated from solid billets by the 100kW (continuous) spindle. Trials have demonstrated material removal rates of over 13 litres per min, due in part to the linear-axis acceleration of 6m/sec2, and rapid rates up to 60m/min in the X axis (40m/min in Y and Z). The spindle head has three CNC axes (hence its designation M3 ABC), offering extra versatility compared with two-axis heads when executing complex programs. Moreover, movements of ±110deg in the A axis, ±225deg in the C axis and ±14deg in the B axis eliminate the risk of singularity errors occurring in cutter paths, without the need to use avoidance algorithms. Another patented feature of the machine is a robust water-cooled travelling column that does not suffer from the traditional drawback of spindle deviation. 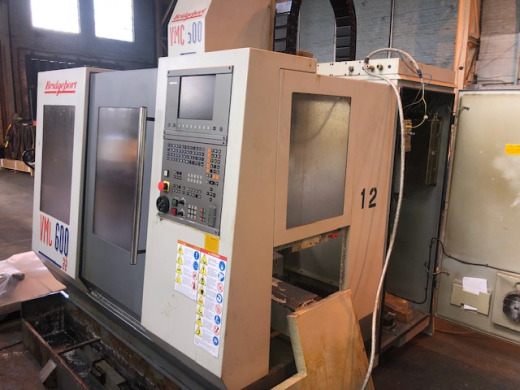 Moreover, the machining centre features a modular design, is compact and requires no special foundation, so it is quick to install and commission. Turn-key solutions are available through Kingsbury; these can encompass special work-holding arrangements, tooling, handling solutions, aluminium swarf briquetting and NC programs for the components to be manufactured. F Zimmermann has created a Web site specifically for the FZH400 HMC (www.fzh400.com/en).